I am so excited to share with you some exciting news that I got this week, plus I finally re-created the Pumpkin Spice Latte. Woohoo!! So what would you like to hear first? I have to share this with you my exciting news first. 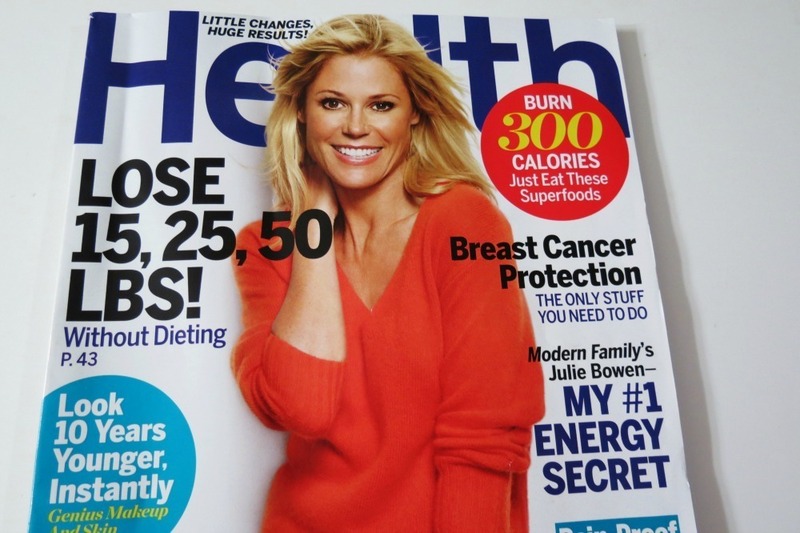 Have you checked out this months Health Magazine? See the chapter ” Lose 15, 25, 50 lbs Without Dieting” on page 43? Guess who is in there? Me!! Remember when I was telling you in July about my hell travel trip back from Europe and I got stuck in NJ and I was freaking out? I pretty much had an anxiety attack while standing in line at the United airline ticket counter. The man reason of the freak out was because I had the Photo shoot the next day. 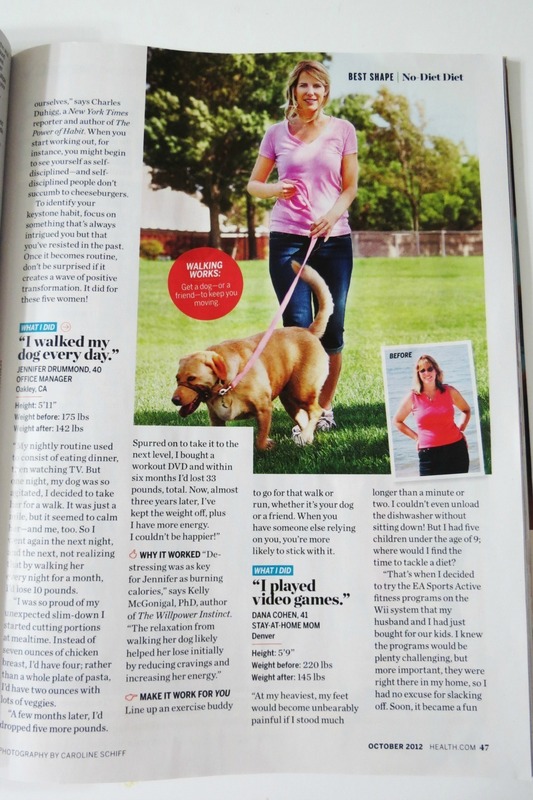 I was so excited that I didn’t want to miss the opportunity to be in a magazine. I will tell you the photo in the magazine does not look like me, at all. They had a make-up artist come to my house to do my hair and make-up. She caked it on. You wouldn’t even know I had a slight sun tan. But it’s still me! 🙂 I wanted to share this with you sooner, but in case it didn’t go through, I didn’t want to jinx myself. I really can’t believe it!!! Oh and that’s my girl Samantha with me!! 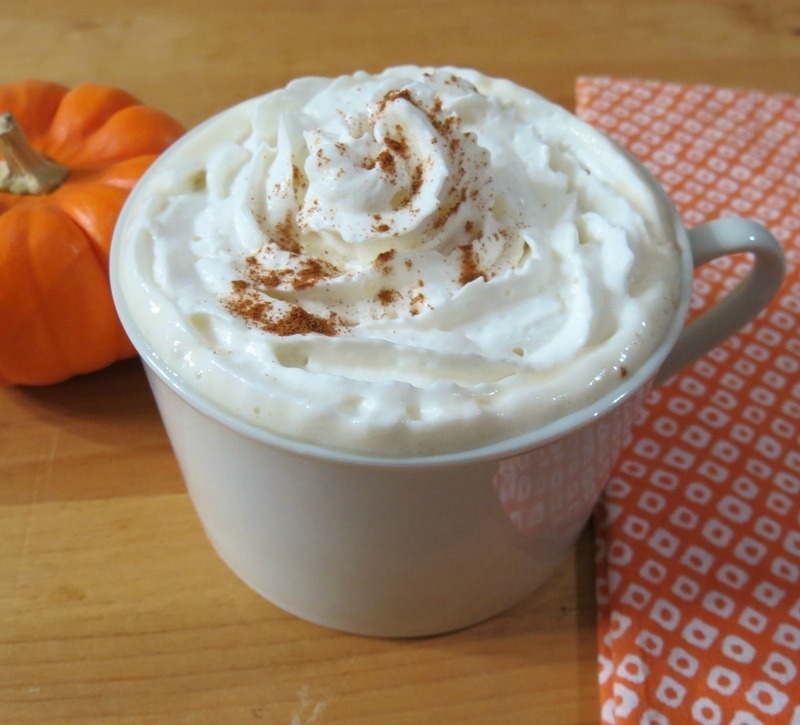 Now the moment you have been waiting for, my Pumpkin Spice Latte. I have been asked for about a month to re-create this drink and after trial and error, I finally created it!! I made this drink about 5 times until I perfected it. My biggest error was the coffee. Either it was too much, not sweet enough or plain old nasty tasting. Just look at my trial sheet. This drink tastes simply wonderful. Not to spicy and not to strong of a coffee flavor. I’m really happy with the outcome. The only thing is, that there is some spice and pumpkin that settles to the bottom. I think I would recommend placing it in a blender to really make it light and frothy, so none of the ingredients settle. I found the main key thing to making this drink is once you make the pumpkin milk mixture to add the coffee to it and taste it. This is where you can determine if you need to add more sugar or not. 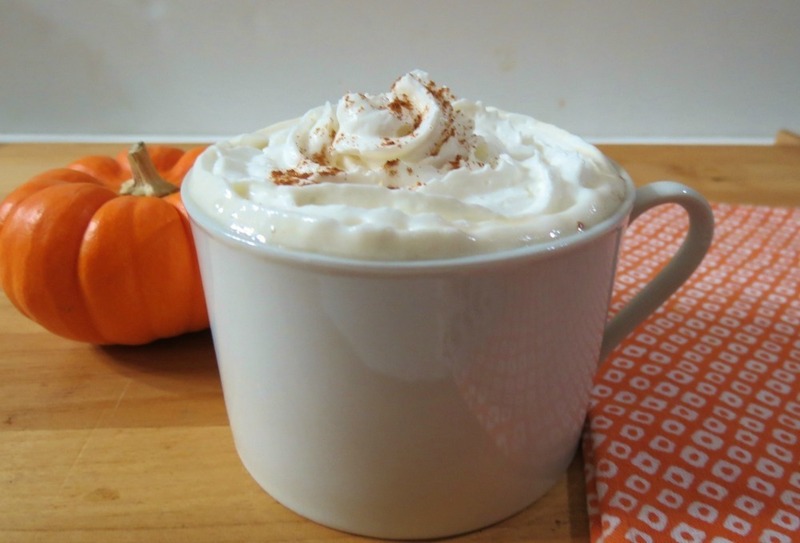 This recipe makes 1 1/2 cups of pumpkiny goodness. This will be wonderful drink on a chilly morning. For me it’s in the 90’s, so I’ll be sticking to my Pumpkin Frappe for a while, but I will be sure to make this when the weather cools. I kind of can’t wait for that. It’s suppose to be near 100 this whole weekend and I”m ready for fall fun!! 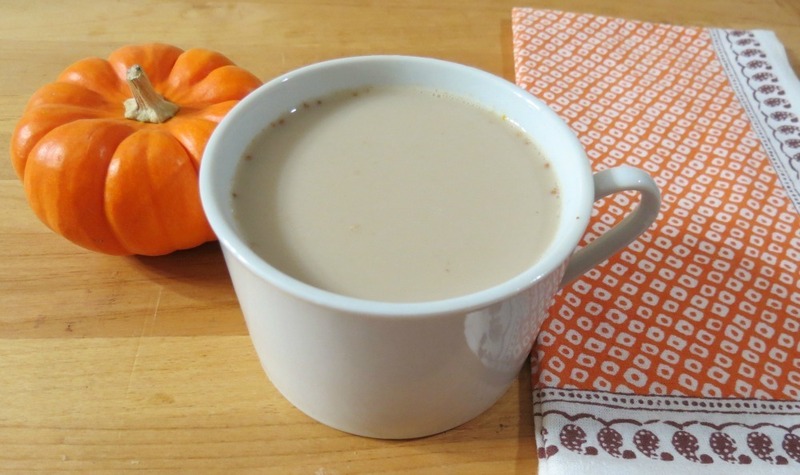 A hot, sweet, creamy, low calorie coffee drink that tastes just like pumpkin!! In a small sauce pan, over low heat, add milk, pumpkin, vanilla extract, pumpkin spice and stevia. Whisk together, until milk is warmed and no lumps remain. Add your coffee to the sauce pan, and whisk until combined. Test it to see if you need to add more sugar. Pour into a coffee mug. Enjoy! Even though it’s time for bed, you know I have fun doing my comparisons. Check it out!!! Look at the carbs and sugar difference! This makes me love my drink all the more!! Remember the key thing to making the latte is to keep whisking the drink while your warming it in the pan, don’t burn the milk and add the coffee into the milk mixture to see if you need to add more sugar. Everybody’s sweetness level is different. Time for bed, it’ is way past my bedtime!! Good night! Wow. How amazing. Have a great week! You are to funny! He you make me laugh!! I KNEW that was you!! 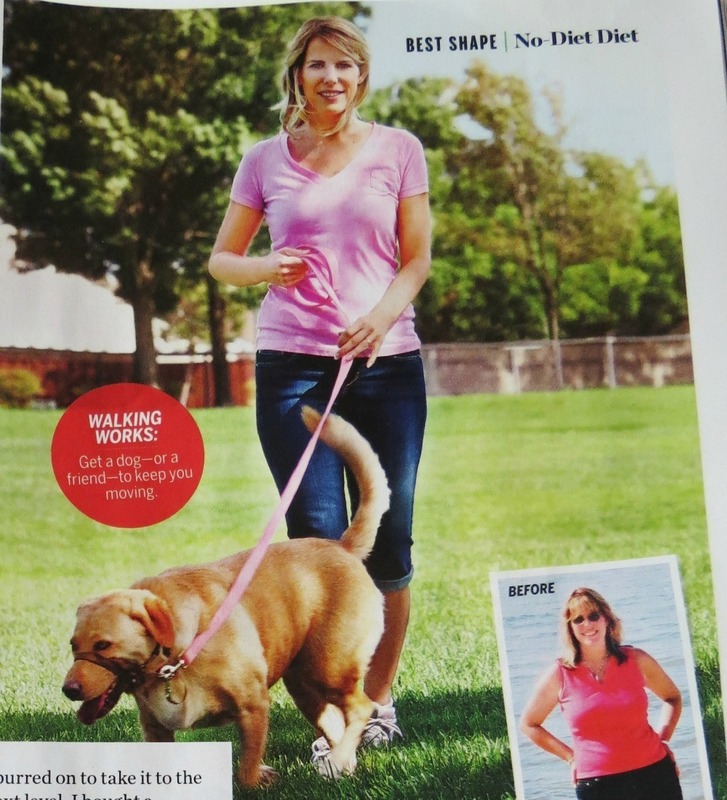 I love Health magazine and was reading my copy yesterday and saw you!! It was fun to say “Hey! I know her! !” Congrats. you look awesome! 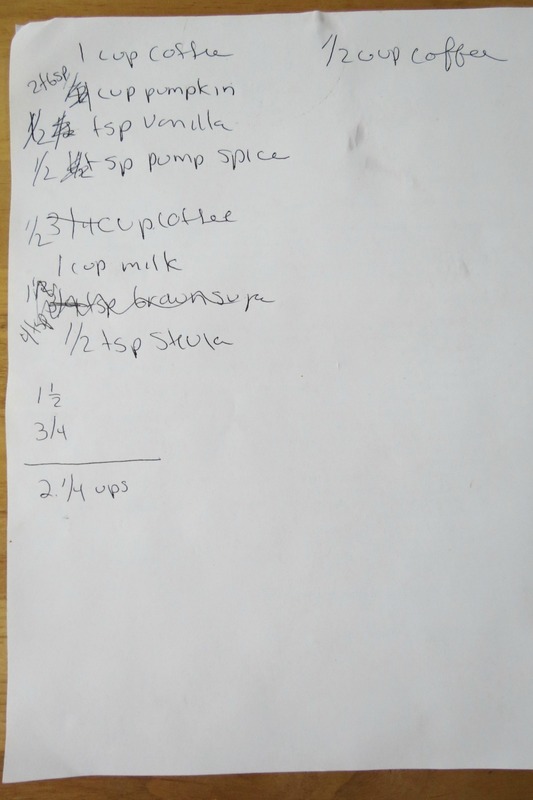 and thanks for the latte recipe! Congrats on your photo shoot and magazine article!!! Great pic of you and your pooch! And the Pumpkin Spice Latte. What a great week for you! If you try this one, let me know what you think of it!! Congratulations! It’s nice they rcognized your accomplishment. Thanks for the recipe. Jenn: You look fabulous in the photo. That is such anaccomplishment. 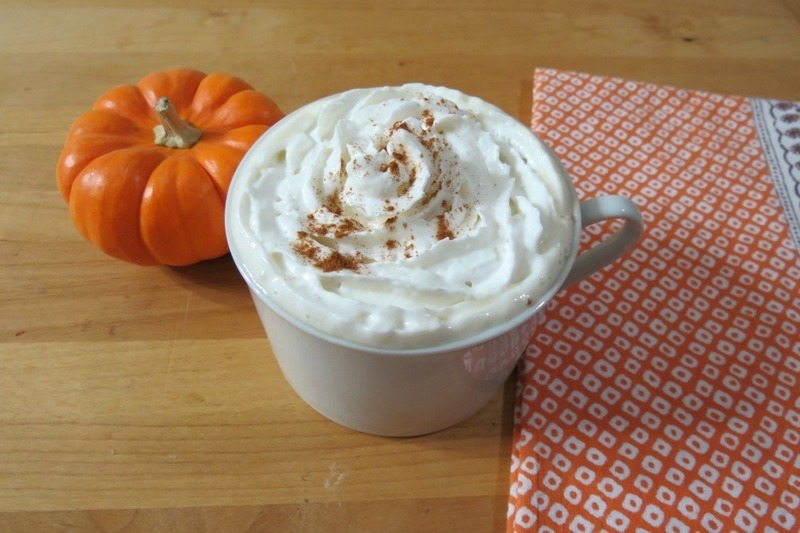 Oh and the pumpkin latte, well, you hit the jackpot on that one. What time should I come by for a cup? They got such a cute picture of you! Congrats 🙂 I LOVE pumpkin spice lattes and never order them because I don’t want to drink 1,000 calories. I’m loving the idea of a lightened up, less guilty version! Me too! I can’t get over all the calories and sugar the coffee houses put into them! Oh no you didn’t! Pumpkin Spice Lattes are my addiction. Now I can make them at home, yum! Congrats on the mag!! I love Pumpkin Lattes and Frappes! Their my addiction too!! Thank you! You are my coffee goddess-must make this drink! You look stunning in the magazine. Congrats for inspiring so many people with your story! Congrats on the magazine!! That is just so cool, you look awesome! (even if it doesn’t look exactly like you). Jen, that is so so so cool!! Congrats on the feature!! 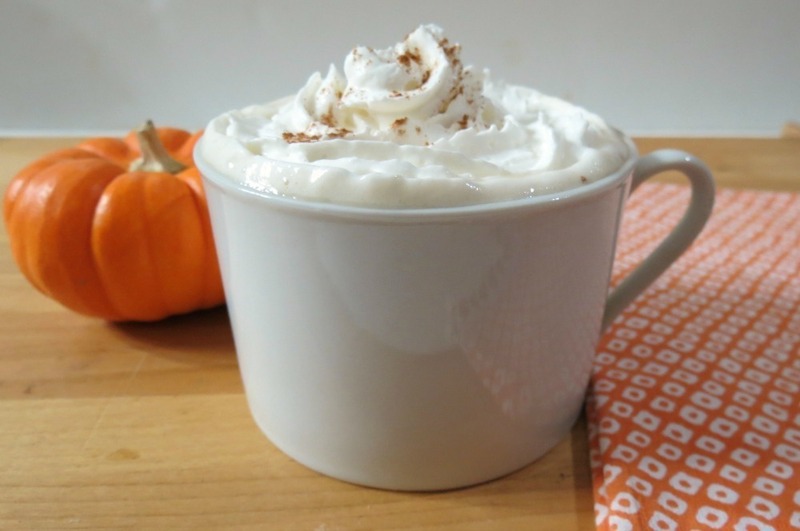 I love making my own pumpkin spice lattes at home, but I am still trying to perfect the recipe. I will try this one! Thanks Stephanie!! Let me know how you like this drink!! Thank you!! It’s been hot here! Matter in fact it’s 8pm and 90 degrees out, were finally getting our summer! Stay warm in Ohio! Oh how I adore! drinks like this…thanks for sharing your end result after much trial and error. Congrats! on making the magazine too – that is WAAAYYY wonderful! So excited for you…thanks for inspiring too. Congratulations!!! How exciting to be in a magazine! Your recipes are amazing…I’ve tried several and I can’t wait to try this one too. I am a huge coffee drinker and I’ve given up a lot of them because of the calories/fat. Thanks to you, I’ve been able to enjoy many now 🙂 Thank you for always sharing at Mix it up Monday! Hi! I’m new to your blog (found the recipe on Pinterest) but your recipes look fantastic! Quick question though, would I be able to make a bunch of the milk and pumpkin mixture and save it, then warm it up later and add coffee? I don’t see why not! Just be sure to whisk it before serving. That’s a great idea, I think I’m going to try that!! Have a great day!! Ohhh Kate, thank you so much! Congratulations to you on your weight loss. That is quite an achievement!!! I understand how hard it is and the whole reason I created the blog was to show people you can have everyday food without sacrificing flavor or buying odd ball ingredients. Thank you again so much, by the way I think you Rock!!!! Congrats this is soooo AMAZING! WOW! How did you get into the magazine? Thanks Sophia! I did all the nutritional value on the Last Trader Joe’s Cookbook and the publisher referred me to Health Magazine. I just made this and it’s delicious! Thanks so much for sharing! I love PSLs from Starbucks but they are so expensive and so bad for you. Thanks so much for giving us a guilt free version! Looks yummy! For those of us counting carbs, it would work with half-and-half instead of milk. Definitely gonna try this once the temp outside gets below 90!